L'AirLink® MG90 est une plate-forme multi-réseaux LTE-Advanced de haute performance conçue pour offrir une connectivité sécurisée et permanente aux applications critiques dans les services de sécurité publique, de transport en commun et sur le terrain. Avec une connectivité multi-réseau extensible, le MG90 offre une dual LTE-Advanced avec option bande 14, une double connexion Wi-Fi Gigabit et Gigabit Ethernet, avec des extensions aux systèmes de radio mobile terrestre (LMR) et satellite. The AirLink® MG90 is a high performance LTE-Advanced vehicle networking platform, purpose built to provide secure, always-on connectivity for mission critical applications in public safety, transit and field services. With extensible multi-network connectivity, the MG90 offers dual LTE-Advanced with Band 14 option, Gigabit Wi-Fi WAN and Gigabit Ethernet, with extensions to Land Mobile Radio (LMR) and satellite systems. The MG90 dynamically selects the best available network, based on user-customized scoring systems, using its intelligent policy defined link management, and is able to effortlessly switch between WAN connections to provide uninterrupted communications and prevent downtime, performance issues or dead zones. Together with the AirLink® Connection Manager (ACM), the MG90 consolidates the security for all connected technologies in the vehicle area network (VAN), vastly simplifying deployment and enabling the enterprise to retain management control over network access and connected mobile assets. The MG90 seamlessly integrates with the AirLink® Mobility Manager (AMM)—a powerful, end-to-end network management solution—to enable simplified, remote and real-time insight and control of connected mobile assets and mission critical applications, and supports vehicle tracking, telemetry and asset management applications. Purpose built for the vehicle with its ruggedized form factor, the MG90 delivers best-in-class reliability and ensures continual operation in harsh mobile environments. The AirLink MG90 supports up to 21 LTE frequency bands, enabling operation on emerging LTE networks worldwide. It has a single variant for LTE networks in North America, Europe, Middle East and Africa, which allows international customers to use the same AirLink MG90 router in many geographical areas, vastly simplifying large deployments across multiple carriers. With dual-SIM functionality for automatic failover between SIMs, the MG90 offers superior connectivity and cost optimization when roaming. Purpose built for vehicle power environments, the AirLink MG90 does not require any external power conditioning, is optimized to survive extreme transient surges, and maintains continuous power through cold cranking as low as 5V. The MG90 was developed with industrial grade components to accommodate extreme temperatures, such as a customized die cast aluminum housing to manage thermodynamics. It is sealed to meet IP64 for resistance to dust and water ingress, and has been tested to meet and exceed the MIL-STD-810G specifications for shock, vibration, temperature and humidity. Offering built-in vehicle-ready I/O, Bluetooth and Vehicle Telemetry interface, the MG90 enables remote monitoring of auxiliary devices, such as light bars, sirens and gun racks, and can collect OBD-II vehicle telemetry data for engine diagnostic and performance data to monitor vehicle health. Utilizing next generation GNSS location technology that supports 48 satellites from 4 different satellite constellations, the MG90 provides fast, reliable and precise vehicle location information, even in the most challenging environments. The MG90 contains an Inertial Navigation System1 that allows it to track without satellites, using dead reckoning algorithms integrated with the GNSS. The Inertial Navigation System continues to provide positioning information when the GNSS is unable to acquire satellites, enabling tracking through urban canyons, tunnels and underground parking. With its built-in policy engine, the MG90 dynamically selects the best available network, based on a customized user-defined scoring system, including variables such as time, location and vehicle speed. Utilizing traffic segmentation and quality of service (QoS) rules, the MG90 reserves bandwidth for mission critical applications, to ensure they maintain priority. 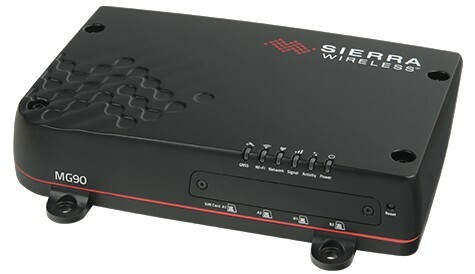 Providing seamless network handover and millisecond network switching with its cognitive wireless system, the MG90 is able to automatically sense, assess and select the best available WAN connection to provide “always-on,” uninterrupted connectivity in any circumstance, preventing downtime, performance issues or dead zones. 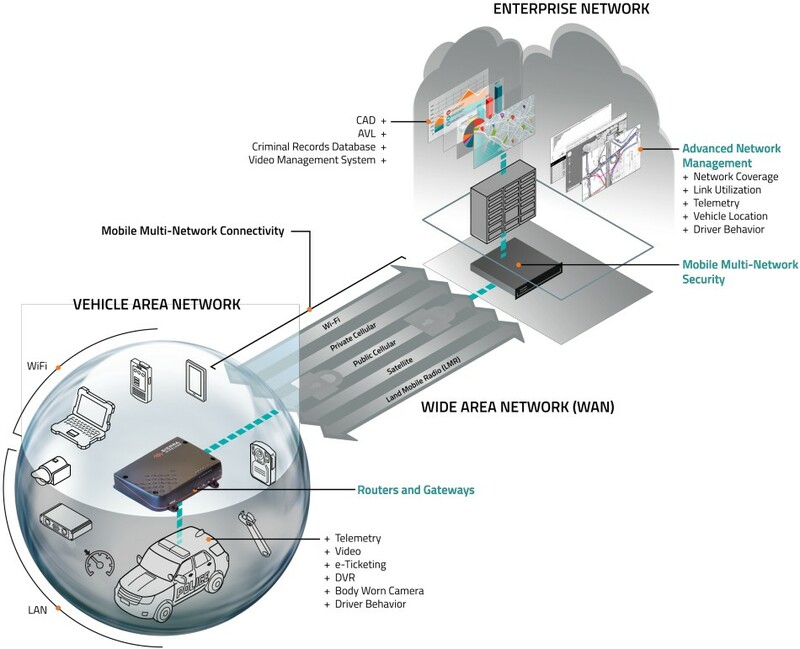 Together with the AirLink® Connection Manager (ACM)—an advanced mobile-optimized VPN server—the MG90 provides secure data connections and retains a static IP address across multiple WAN networks, without interruption or rebuilding VPN tunnels, and consolidates the security for all connected technologies in the vehicle area network (VAN) into a single, centralized platform. This vastly simplifies deployment and enables the enterprise to retain management control over network access and connected mobile assets. The ACM meets industry standard security and uses standards-based protocols. Coupled with the AirLink® Mobility Manager (AMM), the MG90 supports a leading-edge, end-to-end network management solution to enable simplified, remote and real-time mass configuration, control and troubleshooting of all routers, connected mobile assets and mission critical applications. Available in the enterprise datacenter or in the cloud, the AMM seamlessly integrates with the MG90, displaying a dashboard with an up-to-date view of the entire fleet, and delivers a continuous stream of rich, real-time network data, allowing users to observe, track and examine the behaviour of hundreds of devices, networks, and connected vehicle parameters as it occurs. The AMM enables users to create custom alerts and event triggers, and offers on-demand or pre-scheduled historical reports for in-depth analysis and diagnostics including; Network Performance; Link Scoring; Coverage Maps; Trails; Vehicle Heath; Link Utilization; Availability Reports; Router Power Status. The AMM provides fleet operations personnel with real-time visibility into vehicle location, network coverage and tracking of mobile assets. Optional Support: First Net LTE B14(700) for Public Safety.